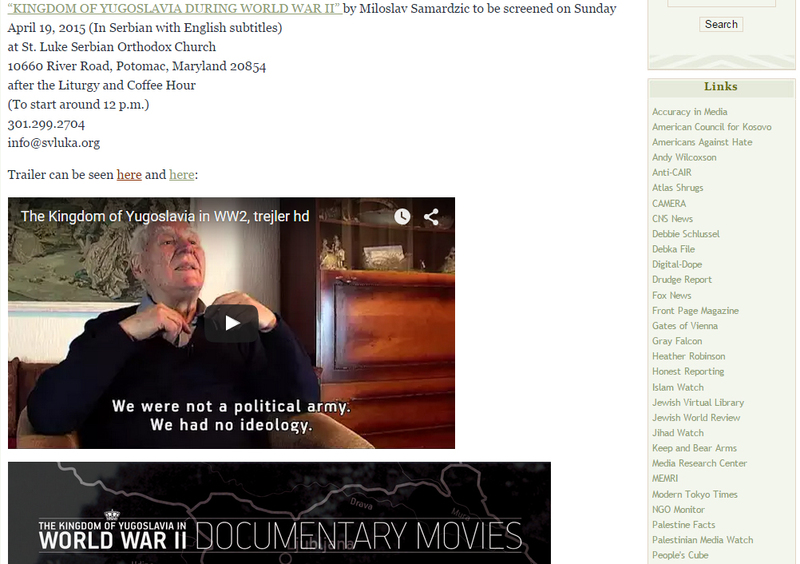 It will be interesting to see whether or not the film, which is full of rare footage and photos, accounts for the Allied betrayal of Mihailovich and Yugoslavia with the little-known fact that, according to American WWII intelligence officer Lt. Col. Robert McDowell, the Vatican needed for the barbarity against Orthodox Serbs by Catholic Croatia — a Hitler-aligned WWII loser and therefore vulnerable to punishment — to be concealed. Meanwhile, Churchill needed the Vatican’s help in keeping the Irish in check. And so a deal was struck: Yugoslavia would be handed over to the Communists, who were adept at suppressing information; Croatia would be reabsorbed into Yugoslavia and therefore would lose without losing; and Tito — that big Partisan warrior against the Fascists, who nonetheless entertained close to 300 meetings with them — would be our man to help everyone forget who did what to whom, under the Commie banner of Brotherhood and Unity. “A Hell Called Jasenovac” by Erwin Miller, translated from Croatian to Hebrew by Miriam Steiner-Aviezer. Yad Vashem Publications, 143 pages, 68 shekels. …It provides detailed description of the tortures and abuse and killings of Serbs, Roma and Jews by Croatians, who employed primitive, cruel, blood-curdling methods throughout most of the war years…Jasenovac existed from mid-1941 until the end of the war. An international delegation eventually paid a two-hour visit to the camp, and a second delegation, from the Red Cross, visited in June 1944 — too late, of course – and without being shown any traces of the atrocities: the shattering of skulls with axes, the severing of body parts, beheadings and hanging of victims on rows of trees, slitting open of prisoners’ stomachs with a unique knife [the infamous “Serb cutter”], and disposal of their remains in the nearby river. The vast majority of killings were carried out with knives, hammers and axes…The rock bottom of the events…is the execution of a young man from [the author’s] town who tried to escape but failed due to heavy snow that upset his plans: he was skewered alive on a pole that pierced his naked body, which turned blue. The screams persisted until the young man finally died. All throughout, the prisoners stood there, weeping. I’m glad to see that Yad Vashem is the publisher of this book, because as recently as my 2007 visit there, throughout all the Holocaust exhibits, nowhere was the word Jasenovac — or even Ustasha or Croatia — to be found. Could 70 years of suppression finally be lifting? Thanks to the publisher of @PoglediFR (or facebook.com/PoglediWorld), Slobodan Kostadinovic, for getting this important work out there.